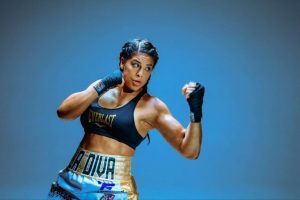 Maricela “La Diva” Cornejo returns to the ring next Friday July 13 at the Novo at LA in Los Angeles when she takes on the undefeated Samantha Pill (3-0, 0 KOs) as she looks to record her 8th consecutive victory. Cornejo (11-2, 4 KOs) a golden boy fighter with huge aspirations of becoming a world champion and to become a major star in women’s boxing. She hopes of one day being in major PPV fight with another big name opponent. The-31-year old now living and fighting out of Los Angeles, California recently talked to boxinginsider about her late start in boxing, her traumatic experience as a young girl that she still deals with today, and her dreams she wants to accomplish in the sport. Cornejo remembers boxing from a very young age, but it wasn’t until just six years ago that she entered a boxing gym initially to lose some weight for an acting role she was preparing for that would spark a serious boxing career. “It wasn’t until six years ago and I had a friend who got me a small role with Eric Roberts in a comedy,” Cornejo told me. “This is going to be on a big screen so I want to look good, so all girls think we can lose 10 pounds over a weekend. “So I go into a gym, which happened to be Freddie Roach’s gym at wildcard and at that time Pacquiao was huge. I go in and they tell me that I hit like a man. “I remember those words coming from Frank who was the trainer. It was the best $500 dollars I invested in myself and I stuck with it and I said ‘I’m going to literally fight my way out of Hollywood,” Cornejo said. Her first week of training at the wildcard, Cornejo didn’t even know what a jab was, but she had a huge vision and one of those goals was to be signed to De La Hoya’s Golden Boy promotions, which she would later make a reality. “I didn’t even know what a jab was. I had this huge vision I said ‘I’m going to get signed with Oscar De La Hoya and Oscar had been there (wildcard) with Amir Khan. He was there with Ricky Hatton as well and they’re watching Amir Khan train with Freddie Roach and I told Oscar ‘you’re going to sign me one day’ and it was my first freaking week of boxing,” Cornejo said. “I fell deeply in love with the sport. Sometimes I ask myself why the hell this sport? But I didn’t even choose boxing, it literally chose me. Because I never ever thought I was going to be a boxer,” she said. “I was sexually molested by a family friend,” she told me. “That took my childhood away and I started seeing things through different eyes. “I would always keep quiet, going from an expressive child to a reserved child and I kept that with myself. Boxing has helped me deal with it; I get emotional when I do speak about it in public because obviously it still affects me. “But I know I’m dealing with it in a positive way because if you don’t it will eat you alive. Boxing is helping me deal with it. It’s an experience I’m blessed with because it’s made me who I am today,” Cornejo said. Cornejo has come a long way since her first week at the wildcard gym. While she took up boxing late and only had a less than a handful of amateur fights, she’s a much more confident fighter now after being able to hang with girls that had much more extensive amateur backgrounds. Her good looks give her attention, but she can also fight and she’s in a hot division for women’s boxing at middleweight that can produce some big fights with the likes of Clarissa Shields, Hanna Gabriels, Christina Hammer, Cecilia Braekhus, and perhaps a rematch with Kali Reis. “I would love to fight with Hanna Gabriels and Cecilia Braekhus. I’ve sparred with Cecilia,” she said. “I’ve told my team to give me the Clarissa fight for end of this year. I’ve been asking for bigger fights, bigger opponents. “I hope I get that. I want to be a world champion, to showcase my true potential and be on a major stage, a major network, and a PPV fight. That is my dream to be on stage and headlining against a very big opponent that’s done the work, just like my team and myself that’s been promoting. “I know that the Clarissa Shields fight is going to be big, her team is doing everything to grow her and my team is doing that as well. When we do meet it’s only going to benefit both of us and most importantly boxing. I can’t wait for that dream,” Cornejo said.